Rainwater harvesting as an alternative water supply for gardening is an innovative and earth friendly approach that anyone can use. Rainwater is ideal for gardening because it is free of salts and other harmful minerals. In many cases rainwater does not have to be treated prior to use. In addition, it can reduce the demand on local water supplies that are becoming a more precious commodity in many communities. For instance, in many drier climates up to 50% of local water supplies are used for landscaping. Harvesting rainwater can also reduce run-off, erosion and contamination of surface water not to mention a savings on your water bill. Mother Nature can provide oxygen rich, contaminant free water that is ideal for your gardening needs. However, during the process of collecting rainwater many contaminates can be introduced during the water harvesting process. Contaminants include algae, air pollution, bird excrement, pesticides, carcinogens, leaves, sand, and dust. One of the most common methods of collecting rainwater is to capture it as it comes out your roof gutters. The volume of water that comes off your roof can be quite significant and is easily collectable. If you are currently collecting rainwater via this method make sure that your gutters are cleaned on a regular basis. It is best to allow the first few hours of a new rain fall to escape prior to collecting especially if you live in a climate were rain is an infrequent event. This will wash off any contaminates that may have settled on your roof since that last rainfall. Filtering is a must for harvesting rainwater. When harvesting rainwater start with a simple screening system to collect larger items, such as leaves, sticks, twigs and other organic items that may have settled on your roof or gutters. If you allow these items to be collected with the rainwater you run the risk of them decomposing in your collected water, that will rob your harvested rainwater of dissolved oxygen and possibly causing anaerobic conditions. Without filtering, you could be watering your garden with harmful non-beneficial microbes that are right at home in anaerobic environments. 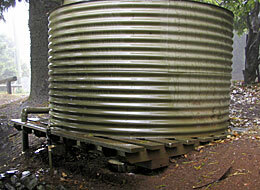 Storing your rainwater can be a challenge and will most likely be the most expensive part of harvesting rainwater. Tanks come in all sizes and can be made of a variety of materials. Some gardeners will collect rainwater in swimming pools during the cold and rainy months when pools are not being used. Most collections tanks are suitable for gardening purposes. A few things to keep in mind; concrete has a very high pH especially before it is fully cured. Curing can take years for fresh concrete. Storage tanks should be opaque. 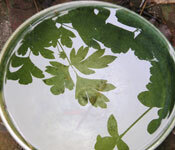 If sunlight is able to get to your harvested rainwater you will greatly increase the potential for algae growth. However the darker your tank the warmer your stored water will become, and we all know that as water temperature rises vital oxygen levels are depleted. Before you use your harvested rainwater you should always check the pH level. You should also pump or siphon your water from the middle of your collection tank. Be careful not to disturb any settlements at the bottom of your collection tank. Check for algae and give the water the old "smell" test (see “The Nose Knows”). If you notice any foul odors, it could be a sign that your water has gone septic and has little or no oxygen available. Treating your harvested rainwater with a little HydroRush prior to using, will give your water a quick oxygen burst. This in turn will allow the beneficial microbes in your garden to thrive that will then promote a healthy growing cycle in your root zone. Rainwater can be safely used outdoors as well and indoors if the correct steps are taken to handle, store and clean it. Although rainwater is not yet common in the United States for indoor personal use, indoor personal rainwater use is practiced worldwide. As population growth continues, water rates increase and the desire to be "more green" and self-reliant increases. Let’s do are part and as gardener and use rainwater on our gardens when it makes sense.